Unemployment rate inched upward to 9.4 percent, 0.2 percent above the U.S. 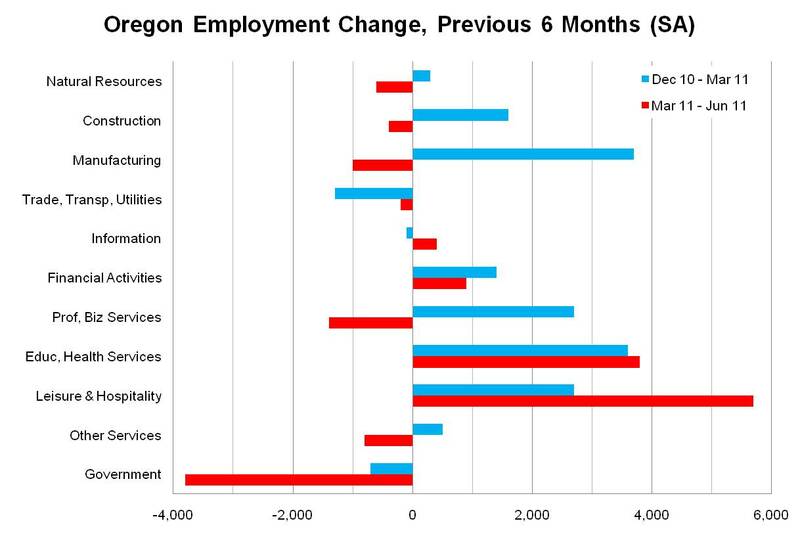 This morning, the Oregon Employment Department released the preliminary June employment figures. On a seasonally adjusted basis, Total Nonfarm employment increased 800 in June, following a downwardly revised +700 gain in May (originally estimated at +1,300). Private sector payrolls increased 3,700 over the past month, however Government cut 2,900 jobs, resulting in a net gain of just 800. After seeing exceptionally strong growth from September 2010 to February 2011 (average gains of nearly 6,000), the past three months have been decidedly slower. In total, the past three months have only seen job gains, on a seasonally adjusted basis, of 2,600 (867 per month average). 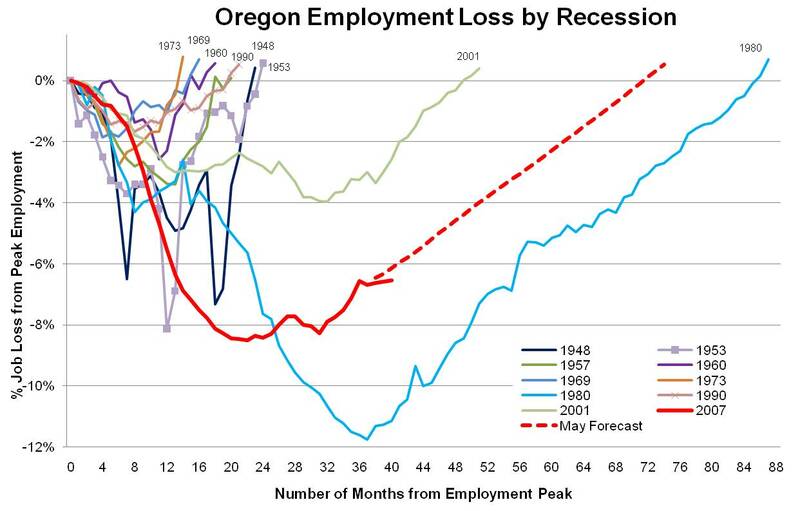 This slow down in the Oregon employment picture mirrors that of the nation overall. Employment at the U.S. level has been slowing in recent months, along with the overall economy. On a year-over-year basis, Total Nonfarm employment has increased 1.28 percent from June 2010, or 20,500 jobs. Employment is currently 6.54 percent below pre-recession peak levels, however employment has increased in 8 out of the last 9 months and is at its highest level since March 2009. Clearly, employment and the economy have stalled in recent months after seeing strong growth just prior to the slowdown. 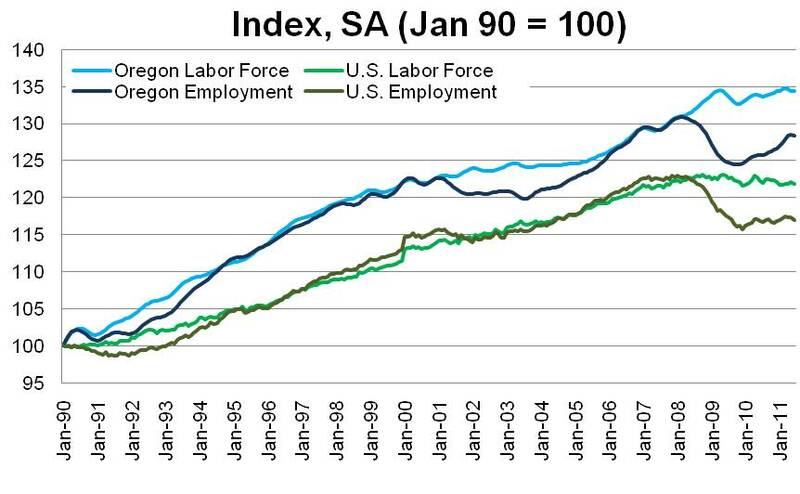 It is interesting to look at the composition of the soft patch in Oregon’s employment. The graph below illustrates the sector by sector employment changes over the past six months on a seasonally adjusted basis. The blue bar represent job changes for the first three months (from December 2010 to March 2011) when the state experienced very strong job growth across nearly all sectors. The red bars represent job changes for the past three months (from March 2011 to June 2011) when the softening hit. During the robust job growth, nearly all sectors saw strong growth with Manufacturing and Education and Health Services leading the way with gains of 3,700 and 3,600, respectively. Professional and Business Services and Leisure and Hospitality were not far behind with each gaining 2,700 between December 2010 and March 2011. Fast forward three months and the picture changes dramatically. On the bright side, Trade, Transportation and Utilities lost fewer jobs in the past three months than the prior three months. Similarly, Information, Education and Health Services and Leisure and Hospitality all added jobs at a stronger pace than they did in the first quarter of the year. However, all other sectors performed markedly worse in the most recent three months, led by Government. Local Government declined 3,800 (predominately these are local education positions), Federal declined 400 and State increased 400, resulting in an overall decline for the public sector of 3,800. Natural Resources, Construction, Manufacturing, Professional and Business Services and Other Services all switched from adding jobs from December 2010 to March 2011 to losing jobs from March 2011 to June 2011. 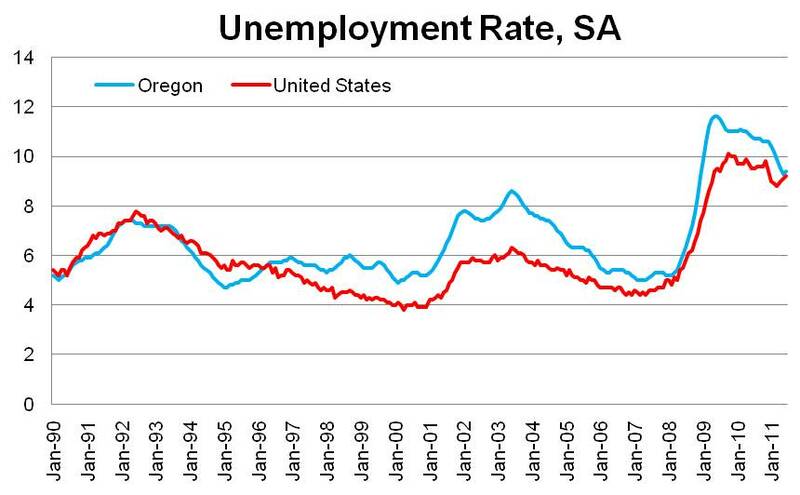 The seasonally adjusted unemployment rate in Oregon stands at 9.4 percent in June. The corresponding rate for the nation is 9.2 percent. The 0.2 percent difference between the state and the nation is the smallest since late 2007/early 2008 (prior to that, you have to go back to 1996 to find such a small difference between the two figures). After declining considerably from the depths of the recession, Oregon’s unemployment rate ticked up slightly in June, by 0.1 percent. The nation’s rate also increased 0.1 percent in June to 9.2 percent. The slowdown, or soft patch, in the economy during the first half of 2011 is evident in the past few months’ employment reports. Job gains have slowed and the unemployment rate is effectively holding steady.